saveyourselfblog | For parents interested in teaching their kids about money. For parents interested in teaching their kids about money. A frazzled mom in the grocery checkout line was trying to ignore pleas from two young children. As the volume got louder, the embarrassed mom relented and tossed candy on the counter. “Fine, now be quiet,” she said. All parents have experienced it. 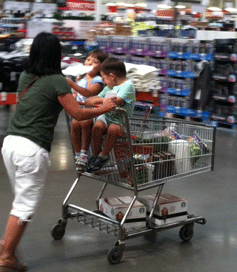 You are heading toward the checkout counter and your kids are antsy. What will happen next? What did the kids learn? Scream long enough and Mom will eventually give in, right? Most parents have experienced a similar plight – I sure have. Fortunately, a parent can turn a trip to the store into a positive Money Moment™ . But preparation is important. It starts by setting the ground rules with the child before entering a store. 1) Know what expected outcome you want. Good behavior? No screaming? 2) Establish and explain how you will reward success. You decide (or negotiate) the reward. Perhaps it’s a piece of candy? Or perhaps you let the child choose the breakfast cereal or flavor of ice cream. 3) If the child breaks the rules, stick to your guns. No rewards! Depending on the age of the child, you might be able involve them in making the shopping list and looking for discounts/coupons in newspapers, etc. Perhaps you can share the savings? Children old enough to run a calculator can help you determine the best deals per unit. The point is to engage the kids in the shopping activity and reward them for good behaviors, not caving in to tantrums. With prior planning and clear communications, you can turn checkout counter meltdowns into a Money Moment™. It’s important to set expectations on behavior prior to arriving at the store. Will you reward good behavior? Will you provide a spending budget for a child? Will you allow them input on some items, such as cereal or cookies? Help your young adults balance lifestyle aspirations with income potential. Our children get career advice from teachers and friends, especially when they reach high school and start career planning. The “help” often includes some sort of reference to “pursuing your passion.” That’s great, except when income potential of the intended career is often at odds with lifestyle expectations. What kind of lifestyle do you expect? Where do you hope to live? What does it cost to live in <fill in the blank>? Have you looked into rental costs? How much annual income will you need to pay your bills? What’s the average annual starting income for your intended career? How much student debt (college or technical college) will you likely have? While most young adults will have lifestyle aspirations, few will be able to fill in the financial blanks. A place to start is with a basic budget. You can download budgets at most state extension service websites or the Economic Policy Institute. Young adults seldom make the effort to balance lifestyle expectations with income potential. Failure to do so can trigger financial disasters. Breaking down individual lifestyle decisions can be the eye-opener, too. Owning/driving a car – Discuss options like buying used versus new cars, hidden costs of insurance, parking fees, fuel, and new tires. Renting an apartment – Talk about location, insurance, utilities, cable/internet, association fees, parking fees, plus commuting time and expenses. College costs – Look up tuition, room-and-board, travel expenses, books and other fees. Most colleges and universities have information on expenses and amount of debt average students carry. Salaries – Then, chat about average salaries for a desired profession. A young adult contemplating his/her career and lifestyle trajectory opens the door to many Money Moments. 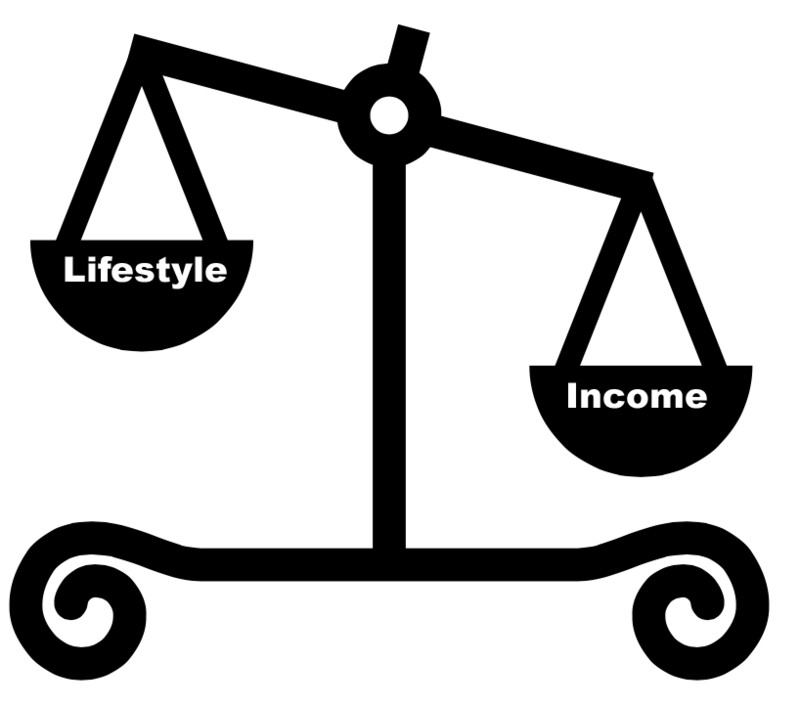 What’s most important is getting the person to realize there’s a balance between lifestyle expectations and income potential. Instead of nagging about the little stuff, focus money saving efforts where the big money is and engage your children in finding solutions. My parents constantly harped, “Turn off the lights!” I assumed the savings were meaningful which is why I nagged my kids when they left on lights, televisions, and ceiling fans. Then I came across an energy study that showed the actual cost of leaving on a light is only 20 cents/day. That’s a day, not an hour. While small change adds up, I wondered whether all my nagging was really worth the resulting angst. Perhaps there were places to save more money and teach children good habits. For example, consider the cost of texting plans for cell phones. The average cell phone bill is now $71/month (one phone) according to J.D. Power & Associates. Some plans with unlimited data are far higher. One friend of mine shared his daughter burned through the family’s cellular data limits instead of connecting through the family’s wifi because she didn’t know how. Another friend saved some dollars switching to a family cell phone plan with unlimited long distance. Could your family save some bucks here? Another savings rich target is wasted food. A report from the Natural Resources Defense Council says Americans waste about 20 pounds of food per person each month, amounting to $1,350 to $2,275 annually for a family of four. What about assigning a child the role of reducing food waste and putting the money into the family vacation fund? Even bigger savings can be captured in other places. For example, discuss with your college students the expense of dropping a class (or two), going an extra semester, or taking the study abroad class instead of a summer job. Thousands of dollars might be saved with better planning. Parents might want to save quarters nagging about lights and long showers but maybe we would be better off picking money battles that have the bigger impact. Why not assign children responsibility for various money-saving roles. Perhaps make one responsible for saving electricity and heat bills. Start by showing them your utility bills. Put another in charge of reducing food waste. Put an older child in charge of managing the families cell phone usage. Set family goals and hold people accountable. The goal of our Save Yourself ™ financial education platform is to motivate young people to save money and then invest it wisely. Unfortunately, this is an up-hill battle because many Americans get discouraged when their savings seem so meager and interest rates paid on savings accounts are so low. 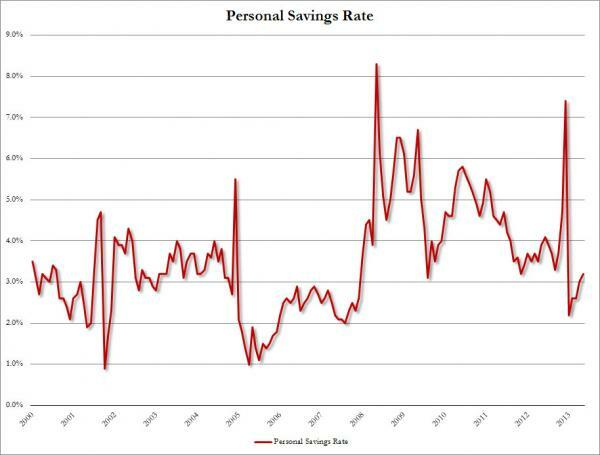 Personal savings rates for Americans have again dropped to around 3 – 4%, following an uptick during the recent recession. The Bureau of Economic Analysis shows that the savings rate for all Americans was 3.2% for May. Depending on the age of your children, you may want to discuss what your monthly savings rate is. What can a parent do to counter defeatist saving attitude? A place to start is to make certain younger children understand that you feel saving money is a priority. Demonstrate how you attempt to save money daily. When old enough to understand, discuss your annual personal savings goal as a percentage of income. Share the reasons why you are saving money – retirement, college, a new car. Put saving money into context. Young adults sometimes don’t realize that saving money involves multiple efforts over decades of time. Share related personal information that demonstrates how you plan to accomplish your savings goals. For example, does your employer match paycheck savings? Let’s say you save 2% and your employer matches it. You have 4% savings. Do you sock away an additional 2% each paycheck? That puts your total savings at 6%. Explain how those amounts compound over time or how you have the money invested. Buying a frozen pizza at a store instead of home delivery can save $10. If you do that once a week, you could save $500 for the year. Need the newest mobile apps? They may cost only $2.99. But if you skip buying two a month, you save $70 in a year. Can cell phone usage be reduced and savings pocketed? Can a rarely used gym membership be dropped? Eliminate weekly restaurant splurges and save $100. These items can result in $500 to $1,000 to save and invest. Demonstrate the importance of scrutinizing spending decisions. There are other opportunities to pocket savings. For example, buying a used car or working a second job for a while could boost savings. Any windfalls – a work bonus, overtime or income tax refund – could be socked into savings, too. My point is these combined efforts to save money can result in a sizable sum. Saving money is an accomplishment. Recognize the child who succeeds in saving money. Smart mother uses a snack budget as a teaching tool. My spouse and I spent a couple days in Disney World earlier in the year. Disney has mastered the art of merchandising, which makes it a great place to watch how parents handle pressures to buy stuff. Disney MagicBands resemble a bracelet. They let patrons purchase items simply by bumping an electronic reader. It makes spending money very quick and easy and secure. Bands for digital payment. For some, the result was tears, pouting and delays. It was NOT a Magical experience for most. One exception was a family of five that sat next to me. Two of the children were enjoying some sort of fruit slushy. But the youngest – I guess he was about 5 – happily sipped from a water bottle. It seemed a bit unfair that the youngest only got water but there were no complaints. Then, I heard the mother tell each child how much money was left in their daily snack budgets. What a smart mother! Each child got a daily budget and could make his/her purchasing decision. 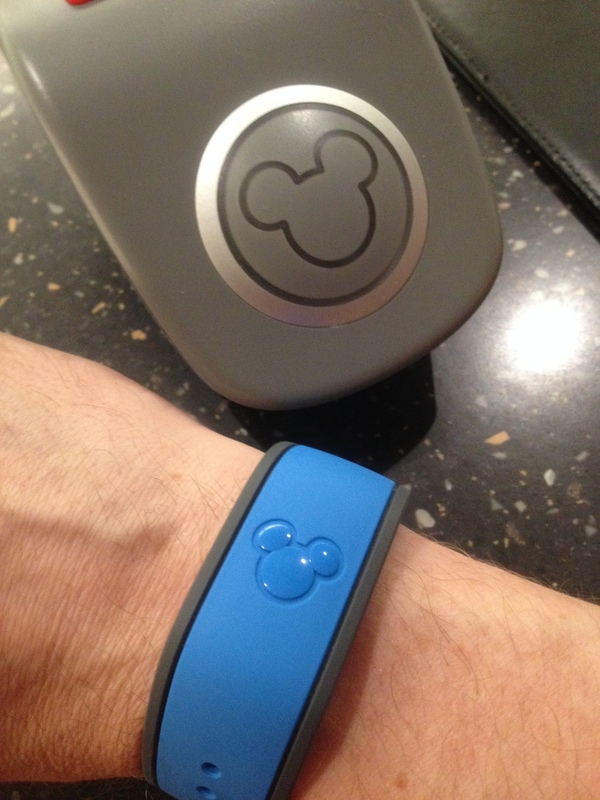 It made me wonder if parents could get Disney to program daily spending limits into each child’s MagicBand. It probably took some training for the kids to understand Mom’s system. But what a great way to teach youngsters about making choices and managing budgets. Give children a budget to spend at parks, football games or other events. It’s a great way for them to learn how to manage money and set spending priorities. Your children’s money management environment is different today – and changing rapidly. Parents can be more effective by recognizing key differences. “Things are different!” is a phrase all parents hear, usually while trying to dispense a bit of wisdom to a close-minded child. But as it relates to the financial realm, your children may have reason to object. Services and products – The financial services industry offers an alphabet soup of confusing options. Abbreviations include: ATM, IRA, 401(k), 529, SEP, PIN, FICA, TSA, NAV, CFP and ETF, to name a few. This makes everything seem more complicated and can be a boring turn-off for kids and adults alike. Technology – Your kids will seldom visit a bank so hauling them down to see the vault won’t be too pertinent. New technologies like on-line banking and mobile banking apps all change how people manage, move and spend money. Parents who embrace these technologies will likely get better reception. Relationships with financial advisors – Older folks valued a personal relationship with a banker, insurance broker and investment advisor. Our kids tend to shop for such services on-line. It’s another mindset difference. Easy credit – Do you remember waiting weeks to get a credit card? Today, someone can get cleared for a credit card while in the checkout line. This makes teaching how to wisely use credit even more important. Internet sales – Our kids are buying more through internet sites. This includes Amazon as well as Craig’s list resale sites. This trend changes how products are researched and serviced and creates security issues to discuss, such as how to avoid getting robbed during a transaction. Fraud and scams – Theft of personal identity and financial information is an international issue, especially for younger people who regularly use new technologies. Cultural pressure to spend – Kids today are under far more cultural pressure to spend. The average amount a teen has to spend is more than $107/week, according to Teenage Research Unlimited. Attitudes toward saving – While there is enormous pressure to spend, cultural attitudes to save have greatly diminished, too. Only about 2 out of 10 teens have a savings account, according to research. This means parents have to work even harder on this topic. Starting out in-debt – The college graduation class of 2013 averaged $35,200 in total debt, according to Fidelity Investments. The common assumption is ALL college students amass such debt, which is not true. Living the “monthly payment” lifestyle – Many young consumers are okay with a debt load as long as monthly payments are manageable. This means dollars that could go towards saving and investing instead pay debt. This cash-flow mentality can be devastating if a job is lost or unexpected expense arises. Each of these “differences” are great topics to explore with your children. We will touch on them in greater detail in upcoming posts. A teen or young adult complaining that “things today are different” when it comes to money has invited an in-depth discussion of those differences and what they mean. Is There a Gene for Financial Success? If financial education works for wealthy families, won’t it work for the rest of us? Are rich people simply smarter at managing money than the masses? Or, is it something else? There is no denying the “wealthy” have easier access to education, support systems and capital the middle and lower economic classes do not. But there is nothing in the genetic makeup of the wealthy that makes them smarter. Their big advantage is a tendency to make financial education a family priority. 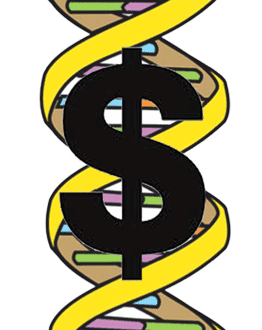 Children with wealthy parents don’t inherit a money gene. But their parents often do talk about money and how it is earned differently. This became evident to me while visiting with a wealthy friend with teen twins. She shared how their family’s bank assigned her children a “personal banker.” This banker set up the teenager’s accounts, and monitored balances. Parents set boundaries on how much money could be spent per month, and reports were emailed to both the teens and parents. The education included seminars on selecting colleges, basic stock portfolio management, even Internet security. This bank’s program had to be very expensive for the bank and time-consuming for the family. Obviously, the benefits had to be substantial to justify it. Parents can be jealous that these so-called rich kids were spoon-fed financial education by their bankers. But with some effort, most of the content is available in most libraries. Genetics has nothing to do with it. A class envy comment about the “rich” is a Money Moment™. Point out that most people got rich by earning their wealth through wise financial management, hard work and/or risking capital. Then, offer support on how to teach your children about money management. A parent’s attitudes toward wealth, business and capitalism can expand – or limit – a child’s opportunities. What are your comments and attitudes teaching? 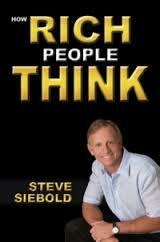 In his book, “How Rich People Think,” Steven Siebold makes some interesting contrasts in how rich people think and talk about money compared to the middle class. Such attitudes can influence a child’s career choice as well as saving and investing decisions later in life. They may support – or limit – a child’s entrepreneurial aspirations. Rich people think that the best route to riches is by owning a business. They know that working for a paycheck earns a living, but seldom results in real wealth. Working class parents have been brainwashed to believe rich people are either lucky or dishonest. Entrepreneurs and the wealthy, on the other hand, portray business ownership as a noble accomplishment, providing jobs and opportunities. Working class parents discuss business ownership as a high-risk endeavor. That’s why they tend to focus on financial and job security. The working class assumes the way to get more money is to work more hours or a get a pay raise. Entrepreneurs don’t fear risk. They understand the importance of recognizing and managing risk. Rich parents teach their kids to build wealth, while an average income parent teaches children how to survive financially. Of course, these are generalities. However, Siebold is right that parents do influence a child’s attitude toward saving, investing and starting a business. What money attitudes are you teaching? Watch for local entrepreneurial businesses to discuss with your kids. Businesses like an ice cream truck or shaved iced vendor are easier for young kids to understand. Count customers and estimate sales per hour. Talk about expenses. In short, get your children thinking about commerce in a positive light. And, consider buying some educational books to teach about how to be an entrepreneur like our own Entrepreneur Extraordinaire. Kids might be less demanding when they know what you are already investing into their financial support. “Dad, can I have $20 for a movie and pizza?” All parents have felt like an ATM dispensing cash for this-and-that. Sometimes, we need to dig in our heels and say, “No.” At such times, it’s good to have a few facts in your mental queue to justify why the request was denied. Raising children costs a small fortune – $1,151 per month on average, according to U.S. Department of Agriculture (USDA) statistics. Of course, parents shouldn’t rub that figure in a child’s nose. But neither should a parent feel obligated to say “yes” to each and every request for cash. This means the average family can expect to spend $234,900 to raise a child to age 17. College costs are tacked onto this figure, says USDA. 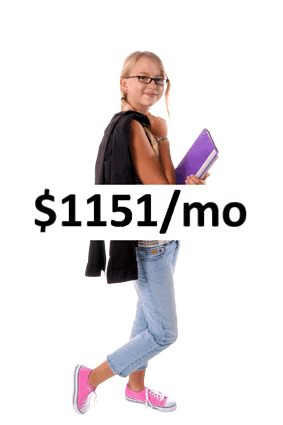 The average cost to raise a child is $1151 per month. The USDA’s data excludes insurance, transportation, and clothing, not to mention soccer shoes, music lessons, and educational toys/computers. Of course, family lifestyle differences and location make for wide variations in costs. You can access the entire report at http://www.cnpp.usda.gov and use a cost calculator here. A child asking for a cash handout might appreciate a parent’s frugality once he/she appreciates just how is already being spent per child. Middle school student learns harsh realities of a personal loan. A friend shared a personal story about his first “loan” experience. He was in middle school and wanted a new, expensive bicycle – like his friends had. He had some cash, but needed more to buy the bike. With the summer approaching, he wanted the bike now. So, he convinced his father to loan him the money. But instead of handing over cash, the father insisted on a weekly repayment plan that included interest. They agreed – in writing – the bicycle would be taken away if one payment was missed and returned when the loan was current. The bike would be sold if two payments were missed. My friend never missed a payment, he said. But he recalled that his fancy bike was not so cool after a couple weeks. The weekly repayment commitment really stung when his friends decided to go to the movies and he couldn’t go along because of his bike obligations. It sounds like a tough bargain with difficult choices for a 12-year old boy. But it certainly made an impression on my friend who vividly recalls it 20 years later. A child asking for money to make a special purchase has created several Money Moments™. Topics include: comparison shopping, loan programs, earning the extra cash with chores, plus discussions around wants versus needs.